Make yourself at home in one of the 33 air-conditioned rooms featuring kitchenettes. 32-inch LCD televisions with cable programming provide entertainment, while complimentary wireless Internet access keeps you connected. Private bathrooms have deep soaking bathtubs and complimentary toiletries. Conveniences include phones, as well as laptop-compatible safes and desks. For lunch or dinner, stop by Victoria Restaurant, a restaurant that specializes in international cuisine. Dining is also available at the coffee shop/café, and 24-hour room service is provided. Unwind at the end of the day with a drink at the bar/lounge or the beach bar. A complimentary buffet breakfast is served daily from 6:30 AM to 10 AM. At Marphie Hotel, enjoy a satisfying meal at the restaurant. Wrap up your day with a drink at the bar/lounge. A complimentary continental breakfast is served daily from 7 AM to 10 AM. 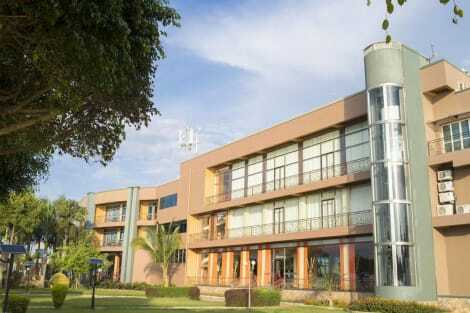 A stay at Airport View Hotel places you in the heart of Entebbe, steps from Lake Victoria and a 5-minute drive from Entebbe Golf Club. This golf hotel is 1.9 mi (3.1 km) from Entebbe Botanical Garden and 2.3 mi (3.6 km) from Ugandan Wildlife Education Centre. Take advantage of recreation opportunities such as an outdoor pool or take in the view from a terrace and a garden. Additional amenities at this hotel include complimentary wireless Internet access, a television in a common area, and a picnic area. Enjoy international cuisine at Mount Elgon's, a restaurant which features a bar, or stay in and take advantage of the 24-hour room service. A complimentary buffet breakfast is served daily from 6:30 AM to 10 AM. Just 10 minutes from Entebbe Airport, we are a boutique hotel set in a former presidential residence. Catering to a small number of guests at any one time, we offer a high level of personalised service, quality food, 24 hour reception, relaxing swimming pool and a comfortable sleep. Whether your visit to Entebbe is for business or pleasure, you'll feel at home with us. 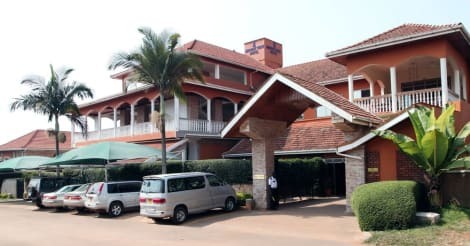 When you stay at Imperial Golf View Hotel in Entebbe, you'll be next to a golf course, just steps from Lake Victoria and 5 minutes by foot from Entebbe Golf Club. This 4-star hotel is 0.4 mi (0.6 km) from Entebbe Botanical Garden and 0.6 mi (0.9 km) from Ugandan Wildlife Education Centre. Featured amenities include a 24-hour business center, complimentary newspapers in the lobby, and dry cleaning/laundry services. Event facilities at this hotel consist of a conference center and a meeting room. A roundtrip airport shuttle is complimentary during limited hours. 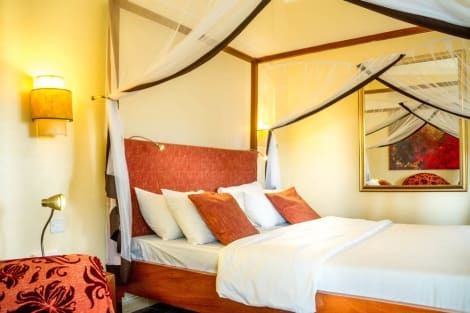 lastminute.com has a fantastic range of hotels in Entebbe, with everything from cheap hotels to luxurious five star accommodation available. We like to live up to our last minute name so remember you can book any one of our excellent Entebbe hotels up until midnight and stay the same night.